We explain how to watch BBC iPlayer from abroad (outside the UK) with a VPN and the best VPNs to use. 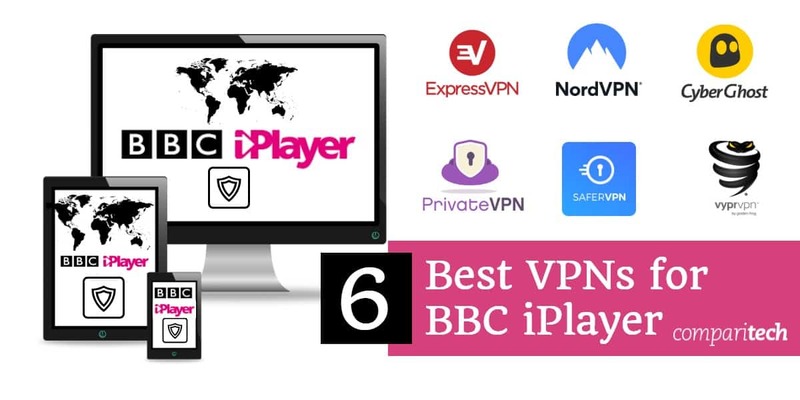 In response to BBC iPlayer detecting and blocking more VPNs, we’ve updated this article for 2019 with the latest working VPNs. BBC iPlayer is a popular streaming service that lets viewers watch some of the best free and legal content on the web, ranging from TV shows and movies to live sports. Much of that content, however, can only be streamed on devices with a UK IP address. Due to content licensing restrictions, certain videos are restricted by geography. This applies to viewing on the iPlayer website as well as through the iPlayer app. The simple solution is to employ a VPN to unblock BBC iPlayer which will allow you to watch as normal from the USA or anywhere else abroad. ExpressVPN Best option for accessing BBC iPlayer from anywhere. Fast speeds, great security features, and works with nearly all popular streaming services. Includes 30-day money-back guarantee. NordVPN A good budget option that works well with BBC iPlayer and other streaming services, including Netflix. CyberGhost Good value and fast. Works with BBC iPlayer. PrivateVPN Good up-and-coming VPN that works well with BBC iPlayer and other streaming services. SaferVPN Works well with BBC iPlayer and Netflix. VyprVPN Unblocked BBC iPlayer in our tests. Short for virtual private network, a VPN service encrypts a device’s internet traffic before routing it through an intermediary server in a location of the user’s choosing. In the case of BBC iPlayer, the user just needs to pick a server in the UK. They’ll be assigned a UK IP address to make it appear that’s where they’re located. But this workaround is getting less effective by the day as BBC iPlayer starts cracking down on the circumvention software and detecting when a VPN is used. The site has followed in the footsteps of Netflix when it comes to banning VPN users. For this reason, it’s important to subscribe to a VPN service that bypasses iPlayer’s firewall and will actively work to fix the problem if it gets blocked. Often times only some servers from a specific VPN service can accomplish this, so if one VPN server is blocked for you then just try another or ask customer service which ones work. These 5 VPNs will work with BBC iPlayer from abroad (outside the UK). ExpressVPN operates servers in six locations across the UK alone. We bypassed the geo-block to watch an episode of Blue Planet II with no issues. ExpressVPN is probably the most reliable when it comes to speed, consistently scoring among the fastest. It offers a 30-day money-back guarantee and claims thousands of customers use their service to watch iPlayer content. Live chat support is available on the website 24 hours per day, so be sure to ping them in the event you have any issues. ExpressVPN logs no identifying information and uses best-in-class security standards. It operates servers in over 90 countries, each optimized for maximum speed. If you want to watch iPlayer on a device that doesn’t natively support VPNs, ExpressVPN makes its own router firmware which customers can either download install free of charge or purchase with a pre-flashed router on the website. Apps are available for Windows, MacOS, iOS, Android, Linux, and certain wifi routers. BEST VPN FOR BBC IPLAYER ABROAD:ExpressVPN is our #1 Choice. A super fast and reliable choice which unblocks BBC iPlayer in any country and most other major streaming services. Best-in-class security and privacy with 256-bit AES encryption, keep no browser logs, kill switch and leak protection. Try it risk-free with the 30-day money back guarantee. Read our full review of ExpressVPN here. NordVPN operates a whopping 30 servers in the UK, and one of them is even optimized for “ultra fast TV.” Check the NordVPN website’s official knowledge base to find out which servers currently unblock BBC iPlayer content. Live chat support can be contacted 24/7. Speeds are decent and should allow you to stream in HD in most cases. Security is excellent thanks to strong encryption, and a strict zero-logs policy means your information (including your IP address) remains private. What’s more, public wifi users will love NordVPN’s automatic wifi protection feature. Servers are available in over 60 countries. NordVPN allows up to six simultaneous connections on a single subscription, making it a great option for a small household or office. BEST BUDGET VPN:NordVPN is a good value choice. A great value option which works reliably with BBC iPlayer and most popular streaming sites. Connects up to 6 devices simultaneously. App doesn’t offer server switching choice. 30-day money back guarantee. CyberGhost makes unblocking geo-locked content easier than most other VPNs. Instead of contacting customer support or guessing at which server to connect to, CyberGhost’s apps let you choose a server based on the video site you want to unblock. Clicking the streaming option upon opening the app will bring up a lengthy list of popular streaming sites, including BBC iPlayer. Just click that option to get connected, and the app will even open iPlayer in your browser for you. CyberGhost also boasts a strong security and privacy pedigree. It keeps no logs and uses strong encryption with perfect forward secrecy. Leak protection and a kill switch ensure none of your data ever leaves the encrypted tunnel. CyberGhost boasts fast speeds that should be more than sufficient for streaming video in high quality. A single plan allows up to seven simultaneous connections. Apps are available for Windows, MacOS, iOS, and Android. BEGINNERS' CHOICE:CyberGhost has a simple set up. A budget choice. Good on privacy. Streams BBC iPlayer in HD video reliably. Hit and miss connections with some popular streaming sites. 45-day money back guarantee. PrivateVPN is a relative newcomer to the VPN space that has thus far impressed us with its excellent content unblocking capabilities. It makes short work of BBC iPlayer’s VPN firewall, and also works with other streaming sites like Netflix and Hulu. Round-the-clock live chat support is at your disposal. Speeds are excellent despite the comparatively small network of servers. Security doesn’t fall short, either, sporting 256-bit and 128-bit encryption options guarded with perfect forward secrecy. PrivateVPN stores no logs of user activity and won’t record your IP address. You can connect up to six devices on a single plan. Apps are available for Windows, MacOS, iOS, and Android. GREAT SPEED:PrivateVPN is a good family choice. Unblocks many popular UK shows and allows up to 6 devices on the same account. Small network of servers but fast connections. 30-day money back guarantee. SaferVPN boasts dedicated streaming servers for the US and UK. The UK streaming option unblocks BBC iPlayer content without breaking a sweat. The US streaming server unblocks Netflix and Amazon Prime, among others. These servers are separated from the rest of the UK and US non-streaming servers, which makes them easy to find without the need to guess or get help from customer support. That being said, live chat support is available around the clock. Speeds are fast enough to stream in high definition. The app is extremely easy to use, even for a complete novice. Encryption is strong but SaferVPN lacks perfect forward secrecy at this time. The company stores no logs of users’ activity and won’t record your IP address. SIMPLE INTERFACE:SaferVPN achieves great speeds. Reliably unblocks geo-restricted content and has great privacy credentials. Lacks some popular features. Includes 30-day money back guarantee. VyprVPN has high-speed servers making it a great option for unblocking the BBC iPlayer streaming service. It also works to unblock content from other popular sites, including Netflix. As a bonus, plans include access to online storage and encrypted messaging apps. This VPN service uses strong encryption and includes DNS leak protection and a kill switch. It does store some logs, including the user IP address which might be a turnoff to more privacy-conscious users. It scored well in our speed tests, so you should have no problem streaming the latest season of Peaky Blinders in HD. EASY TO USE:VyprVPN is user friendly. A solid choice. Stores no logs, offers great security and unblocks most streaming services. More pricey than some. 30-day money-back guarantee. Our tests show that the following VPN providers do not unblock the BBC iPlayer, according to our tests. Although many of the VPN providers in the above list may be excellent for other online activities, you would be wasting your money with them if your main aim is to get videos from the BBC iPlayer over the internet while abroad. Download and install the VPN for your device from your provider’s site or an official app store. We recommend ExpressVPN. Run the app and choose a VPN server in the UK that unbloks Netflix. If you’re not certain which to choose, consult your provider’s website or customer service. Clear your cookies and your browser cache. These can store location information from previous sessions. Open BBC iPlayer and start watching! If you encounter any issues, contact your VPN’s customer support. You might need to adjust some settings on your device. Note that we can’t guarantee these VPNs will work on the iPlayer website or the iPlayer app. If you run into trouble, it’s often simply a case of disconnecting and trying a different VPN server. If that doesn’t work, there may be bigger issues. If you’re using the BBC iPlayer app, you should know that apps for iOS, Android, streaming media boxes, smart TVs, and game consoles can force a device onto your internet service provider’s DNS servers instead of the VPN’s. One way to get around this is to set up the VPN on your home wifi router or a virtual router instead of using the VPN app. Check out our tutorials on how to configure VPN-enabled virtual routers using both PC laptops and Macbooks. Even after you connect to a VPN server, BBC iPlayer might have stored your previous “location” in a cookie that’s still active. If you still see a warning that the content is not available in your location, you might need to clear your cookies. You can do this either in your browser settings or using an extension like EditThisCookie. Sometimes when using a VPN, the BBC iPlayer page might not load at all and instead return an error page. If this is happening to you, you might need to flush your DNS cache. On Windows, type “cmd” into your search bar and open Command Prompt. Type in the following command and hit enter: ipconfig /flushdns. For Mac users, find the instructions for your version of OSX here. Finally, clear any cached data that might allow iPlayer to see your real location. You can clean out your entire browser cache in the settings, but usually it’s enough to hold CTRL and hit F5 to perform a “hard” refresh. What if I don’t have a UK TV license? When trying to access BBC iPlayer, you might get a notification informing you that a UK TV license is required to watch any program on the site. When prompted, many sources report you can simply click “I have a TV license”. BBC apparently depends on the honor system to keep viewers honest and does not require actual proof that the user has a TV license. This message was added to iPlayer’s terms of service in September 2016. Access to the BBC iPlayer streaming service now requires viewers to register a BBC account and input a valid UK post code. The form does not seem to verify whether or not the registrant actually lives within the postal code they input, so as long as you have a UK IP address, you should be okay. Can I watch Planet Earth II on BBC iPlayer? Yes, Planet Earth II and Blue Planet 2 are both on BBC iPlayer and available for free. It’s even in HD! Just make sure you have one of the VPNs above if you’re outside of the country. You’ll need plenty of bandwidth to watch the wildlife in stunning high definition. 17 What if I don’t have a UK TV license? 18 Can I watch Planet Earth II on BBC iPlayer? 11 What if I don’t have a UK TV license? 12 Can I watch Planet Earth II on BBC iPlayer?